UmmBo! 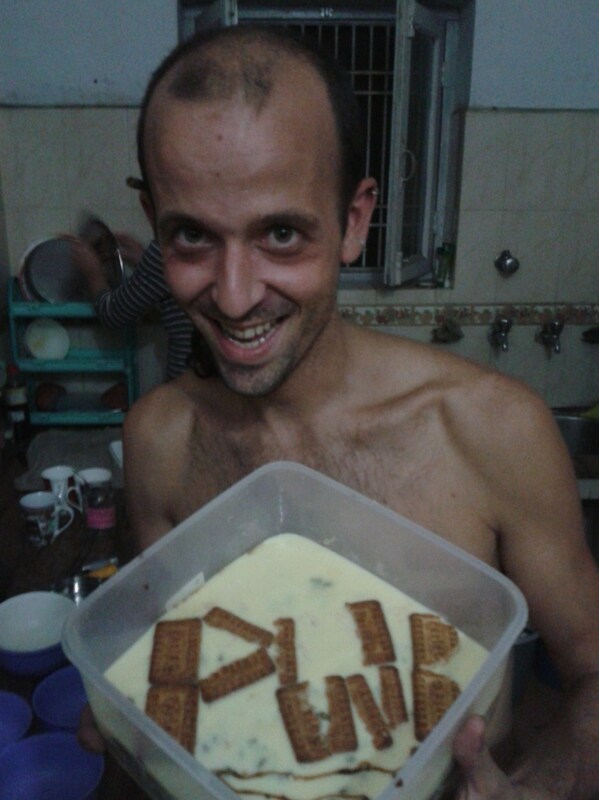 The Last India 2013 Tour Blog! Ummbo! I’m not certain of the correct spelling, is a saying we here in the Himalayas have heard constantly, a saying full of meanings: excitement, amazement, awesomenessness, exactly what the PWB team have set out to bring. One of my personal favourite UMMBO moments was whilst unicycling and having to jump a speed bump…UMMBO shouts an elderly lady! Time has sped past and the project at EWSCT has come to an end for 2013 and subsequently the Tour itself. It has been exciting, amazing and awesome here…UMMBO! (I don’t often say Awesome but truly the scenery here, electrical storms, cloud shapes and beauty allow for it!) Working with the children for a month we have got to know some amazing characters, these children have often come from vulnerable backgrounds and it has been a real joy to witness them gain our trust and find themselves. The playground can be a tough space sometimes which is why the work here we have been doing is really useful, encouraging interaction and play with all the children, not just the older boys taking the space with football or cricket. The last days in Darjeeling have been rainy and full of goodbyes, it is a really special time having spent a month in a place (especially a small town like Darjeeling) it is now full of friendly, recognisable faces…Cake Lady!, Jaworge the Dog, Mr and Mrs Smiley selling Chai and Noodles, the Horse Boys, the Wool Shop people and Glenaries Tea Pots! We have prepared a gift to all the children…it is their very own unique PWB wrist band! A small memento from the team, the children absolutely love exchanging wrist bands, each team member has at least one, and so we have had 100 made for us by Mr Wrist Band Man another smiley face to add to the list. The next thing to prepare for is the Chowrasta Show! The sun is shining as the team descends on its daily commute down to Edith Wilkins Street Children’s Trust. A rough plan has been put together and this morning is the test run followed later in the afternoon by the real deal…The Show in Chowrasta, the main square of Darjeeling. This show is all about the children, we have been waiting the whole month to confirm the date May the 4th be with you! (My personal joke), and suddenly it’s upon us. The team decide to organise a parade from the centre up to the square, the morning is spent practicing routines…what an array of talents…Group Dance and Song, Hoop, Staff, Unicycling and Juggling, Poi with Flower stick, Unicycle/Ribbon/Plate /Yo-Yo mega routine, Diabolo, Clowning and a Hip-Hop Dance Battle! Lunch is provided at the centre and then we eagerly prepare for our parade up the hill. Faces are painted, props handed out and off we go led by Chez chanting at the front…what a noise, what a sight and the weather remains bright! A 20minute march, followed by a few laps of Chowrasta Square and Darjeeling is well and truly woken up…the CIRCUS is in Town! A few words are spoken as a huge crowd develops and then we start with a group song “I like the Flowers” a Chez special with actions! Anke has prepared a huge group dance to the traditional Nepali song of “GangNam Style” (These children absolutely love it?? 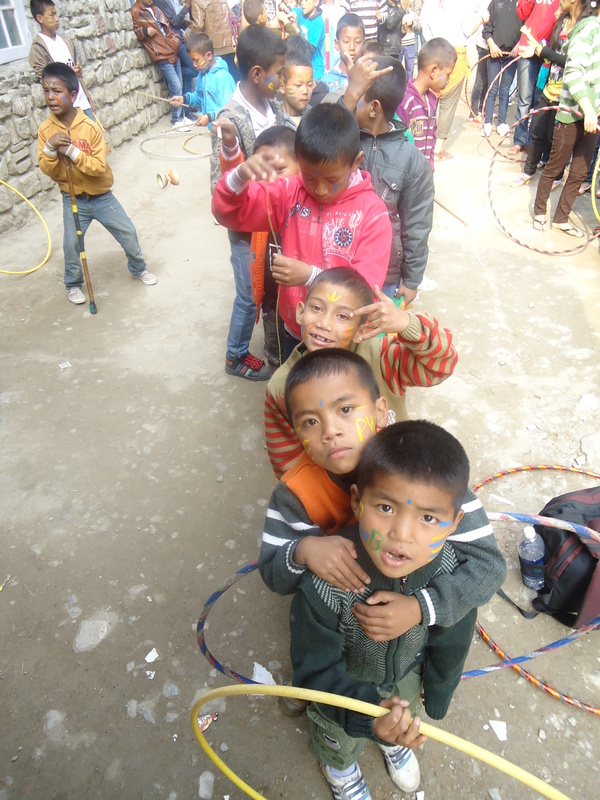 )Darjeeling doesn’t know what’s hit it…Hooping, Spinning, Throwing, Twirling, Cycling, Catching, Laughing and Crying! A total spectacle! I am so proud of the children and the whole team and what can be created when you work hard together! From the PWB team perspective I’m doubly proud, we just seemed to work so well, each one of us concentrated on their group and created something special, to top it all every single one of us got on the microphone spoke to the crowd and encouraged the children, no mean feat! Everyone is very happy as we start to wrap up the show, after a mega mad Hip-Hop battle with Si Beat-boxing and the rest of us attempting to hold the children back allowing everyone to have a go. The Darjeeling weather starts to return to normal and the umbrellas pop up and the crowd heads for shelter. Perfect timing, we are due to perform our show next but the crowd has gone and our energy is fading…we come to a decision to finish for the day! The children are the real stars and it has been super to show the town what this amazing charity (EWSCT) is doing to help these children and others like them in the area. The next few days we return to the centre for relaxed workshops and kit organising/counting. The wristbands are given out, hands are shaken and cards warmly received, handmade by the children with very touching words for us all! There is so much to reflect upon from our time with these children, it really has been special, all the team are sad to leave, I’m sure I will be back some day. So many memories of the whole tour spring to mind: practice on the Beach, waiting for Carlos the Spaniard to arrive (Will he…won’t he? ), train journeys, the noise that greeted us for our first workshop in Topsia, Kolkata, Kasba Girls home performing for us, Paul being chased by 20 or so children, Village experience in Fulbari, Varanasi festivals, Asha Deep show, Cycling along the Ganges River bank, Carlos and his deserts, shadow puppets in power cuts, the Himalaya, marching on an anti child labour march, performing and spreading hundreds of smiles! Throughout the tour we have all had innumerable thoughts and feelings, living together, working together, eating together, being ill together, travelling together, performing together, crying together… Unless you have been on a tour like this it is very difficult to explain. One lasting emotion or feeling that has permeated to all of us on the tour is the feeling of how very lucky we are: Not only lucky to travel to other places, to use our skills, to share our passion for circus, to give something back to those with very little. Lucky also to share this with such talented and creative people, lucky to have gone to, be invited to, experienced sights that many travellers will never see… But above all this, that we are simply lucky that we have come from safe homes, with loving parents, we haven’t had to work from a young age, we have received an education and we aren’t concerned where our next meal is coming from. Simple life perspectives gained or enhanced from doing a PWB tour! Many of us will be heading home with thoughts brimming over…sometimes you have to leave to appreciate what you already have! Keep me travelling along with you. And it’s from the old I travel to the new. You’ll be looking at along with me. Keep me travelling the way I should. You’ll be telling me the way, I know. Thanks to all who have helped to support, contribute and think of us on this tour! My travels are still continuing…wish me luck! Yes, I love Draj! There is something special about this place in the Himalaya’s, high inside the clouds, with a mixture of Buddhists, Hindu’s, Christians and Nepalese, Indian, Tibetan looking people. 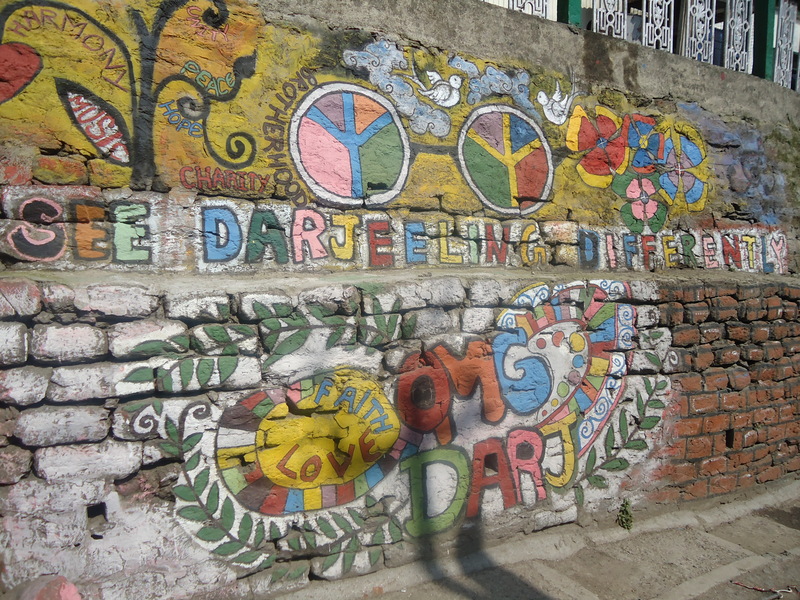 After the heat, chaos, dirt and colours that India had to offer Darjeeling brings a pleasant change with a different energy in a cooler climate. The group energy has changed as well, not only are we just with 6 after Livi’s departure, also for us home is glinting on the horizon. The energy is calm and relaxed. A group of 8 strangers came together in the city of Mumbai and worked, lived, eat and sleep together for 4 months and I feel we have found a good balance together. Got to know each other’s ups and downs and found an optimal curriculum of working together. Yesterday morning, on my last free day in Darjeeling, I sat in the kitchen crocheting a glove for my love while listening to Glenn Miller, drinking a milky coffee when a Himalayan cloud came floating through the window…. Life is beautiful! Like we talked in the meeting the evening before about the world being your oyster, this is definitely a pearl moment and this whole tour has been an invaluable treasure for me. But working together here with the kids puts your feet right back on the ground. Life hasn’t been treating these children right and the world has not been their oyster. At Edith Wilkins Street Children Foundation 97% of the girls and 85% of the boys have been physically and sexually abused. 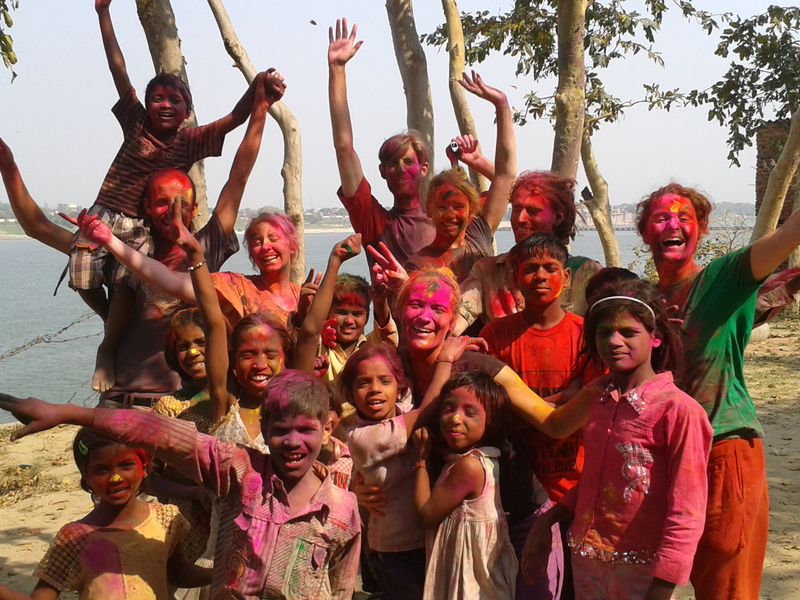 We work with children that are at risk, living in especially difficult circumstances including child labourers, child victims of abuse, trafficked children, street children and children of disadvantaged backgrounds. I get a lump in my throat thinking of this and every time I realise it I feel tears in my eyes. It makes me realize even more how lucky I am with where I have been born and how I grew up. How lucky I am to get the chance to travel and be here doing what I love: Circus and dance! It motivates and stimulates me to share my passion with these children. To create smiles, to work together, to create dreams and give them the feeling they can succeed their wildest dreams as long as they go for it! I love this project and I love these children. Every day I walk with a happy feeling through the mountains towards the foundation. Ready to get together for warm up, games and circus practice. Besides learning just the children’s names we get to know their talents and individual needs. It is great to see children learning tricks, developing their skills, working together to see what they enjoy. It was great to spend a normal Sunday morning at the foundation to see how the normal daily routine is working with so many children in a house. Chez and me watched TV in the girls home while the littlees got their showers. Chez was crocheting them red clown noses while I got a tour around a kitchen and had a chat with the older girls about their dreams in life. Great way of connecting with the children before bursting into circus energy. Also we got to some other projects this last 2 weeks. First of all we drove 5 km down the mountain to Little Paradise in Pashok. 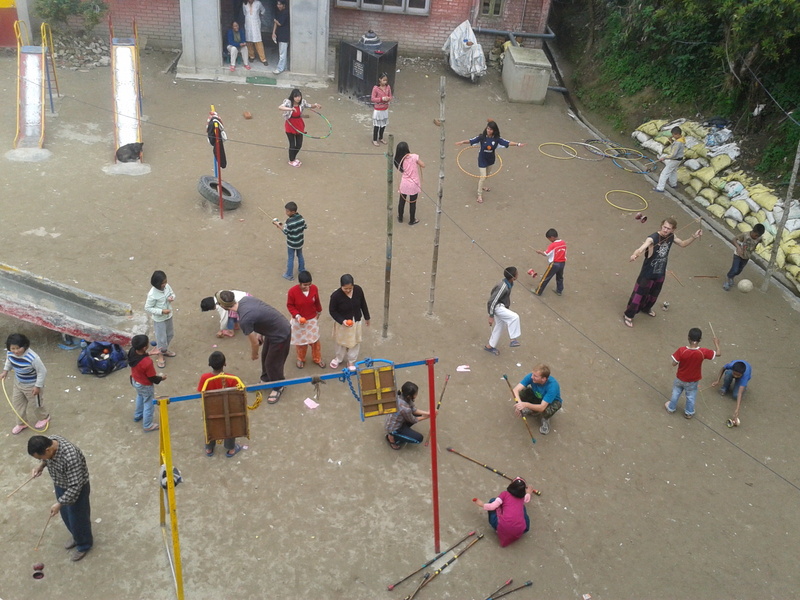 A little primary school that supports children whose parents can’t afford to bring them to school. We got a warm welcome with food and applause and an even warmer goodbye when they performed a song for us. Hayden Hall; A Christian organisation for human development through love and service. We did here a show for about 200 children that get after school care because they don’t have their own home to go to. After the Hayden hall performance we walked down to a school where they celebrated the 10 years existence of EWSCT. Together with all the children we walked a protest march through the centre and market towards the police station of Darjeeling. With signs such as ‘Every child is special’, ‘We want justice’ and ‘Education is their right! Child labour we must fight!’, we protested against child labour and child abuse. With this powerful procession we made the traffic stop and got attention of all the people on the street. At the police station they reminded the police to search for the former child protection officer who had a girl working in her own house who committed suicide. Hand in hand with the little brown hand of little Patrick, the son of the first adopted child by Edith Wilkins, made me realize how important it is to keep on fighting for the safety of all the children who need it! Salvation Army: We did a show here for about 60 deaf and dumb children. Even though they couldn’t hear us they enjoyed the show with a lot of claps and smiles. After the show we stayed to play around with the kids and it was amazing how quickly they were able to copy tricks and moves. There was even a dance battle between Simon and one of the boys who showed us some amazing moves. 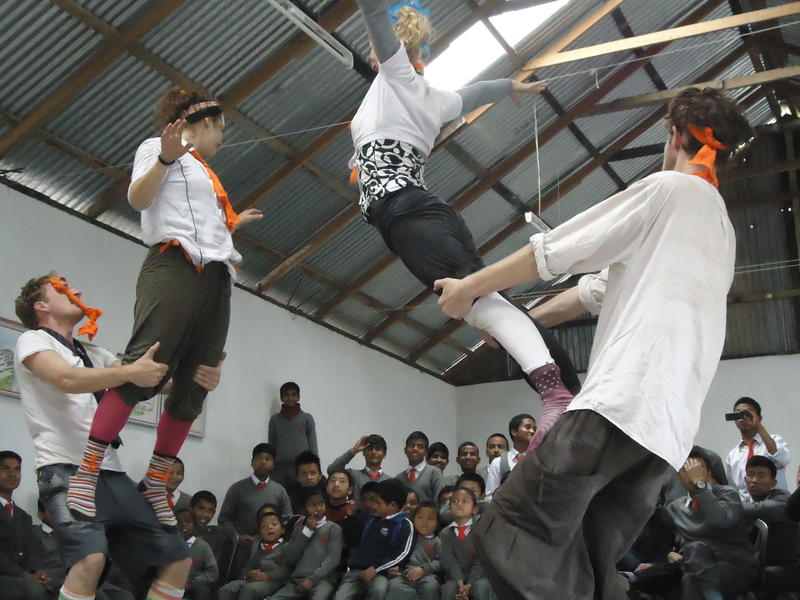 A great example of the power of circus; we don’t need language to teach and have fun! At the moment I am writing this we just came back from an early group visit to Tiger Hill. 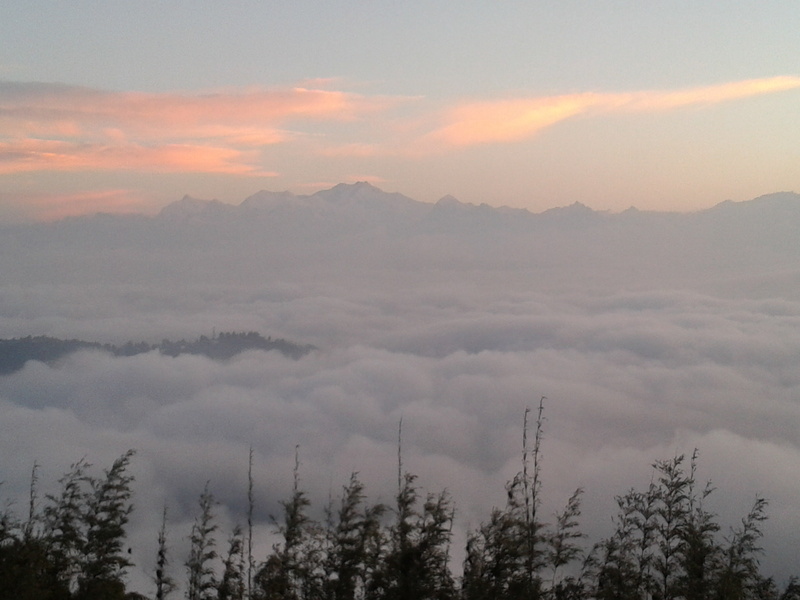 We saw the sunrise in the Himalaya’s with an amazing view on the Kanchengjunga and even a little glimpse of Mount Everest. Beautiful and powerful mountains! One more week to go…. 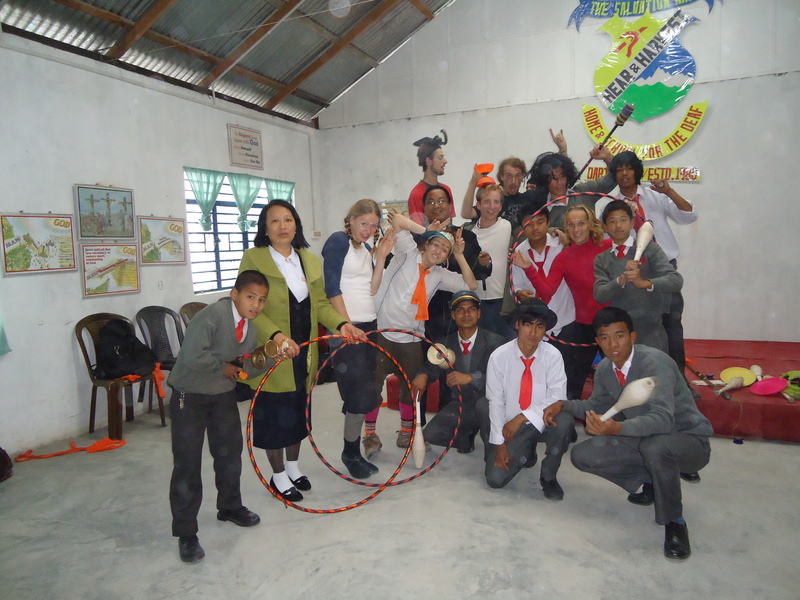 We are working towards the show in Chowrasta together with all the kids as a big finale of our tour. And that will be it….. the end is near now and this will be my last PWB blog 2013. I have enjoyed this tour very much and have learned so much along the way. India keeps amazing and shocking me. There is so much beauty in this country but unfortunately this beauty still has a flipside….. 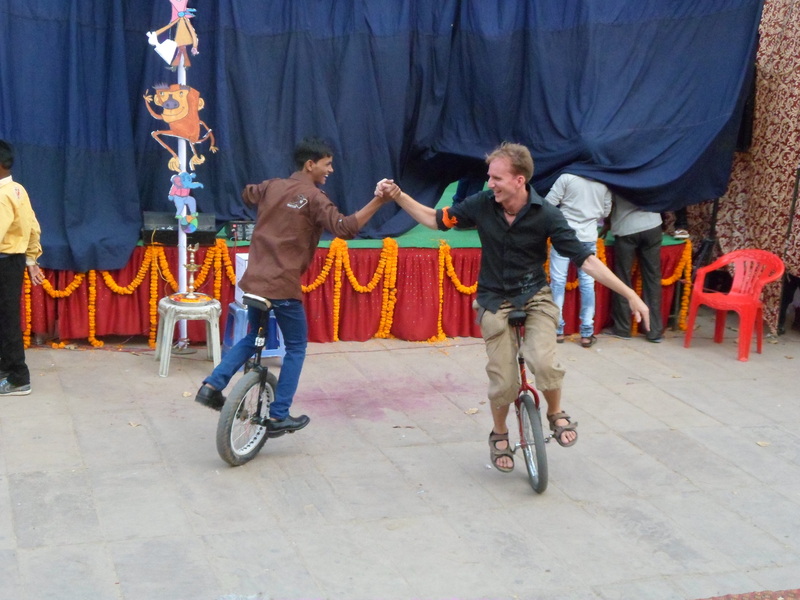 This is exactly why PWB comes to India: Let’s bring some circus smiles into the Indian children’s lives! You are currently browsing the Performers Without Borders blog archives for May, 2013.